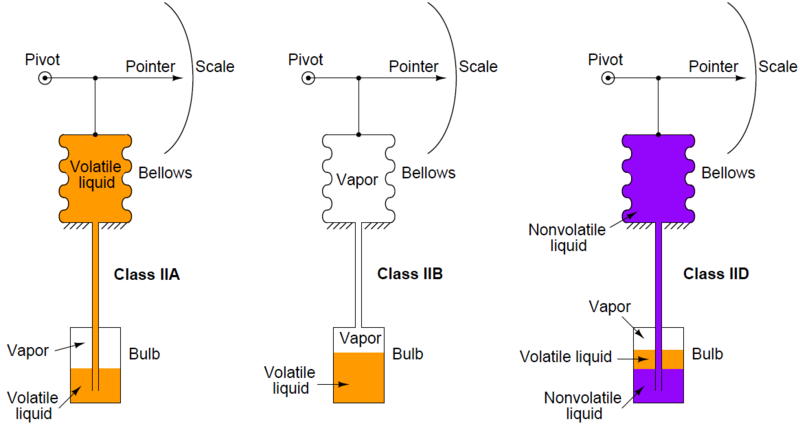 Filled-bulb systems exploit the principle of fluid expansion to measure temperature. If a fluid is enclosed in a sealed system and then heated, the molecules in that fluid will exert a greater pressure on the walls of the enclosing vessel. By measuring this pressure, and/or by allowing the fluid to expand under constant pressure, we may infer the temperature of the fluid. 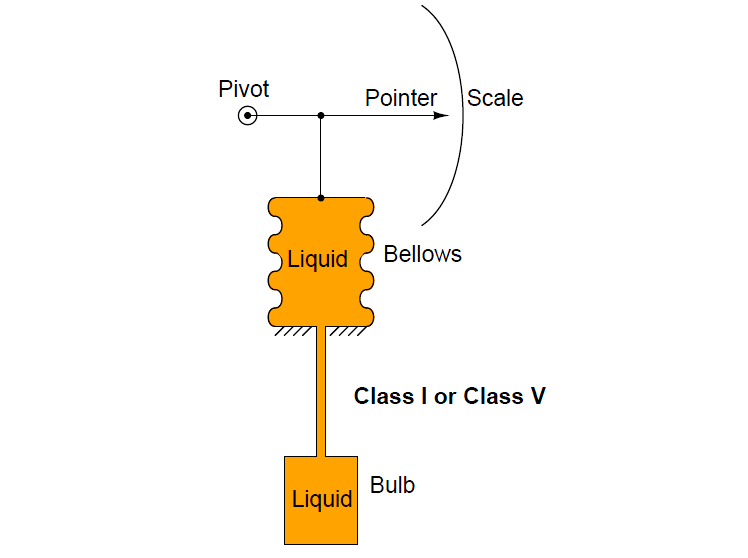 In these systems, it is quite critical that the tube connecting the sensing bulb to the indicating element be of minimal volume, so the fluid expansion is primarily due to changes in temperature at the bulb rather than changes in temperature along the length of the tube. It is also important to realize that the fluid volume contained by the bellows (or bourdon tube or diaphragm . . .) is also subject to expansion and contraction due to temperature changes at the indicator. This means the temperature indication varies somewhat as the indicator temperature changes, which is not desirable, since we intend the device to measure temperature (exclusively) at the bulb. Various methods of compensation exist for this effect (for example, a bi-metal spring inside the indicator mechanism to automatically offset the indication as ambient temperature changes), but it may be permanently offset through a simple “zero” adjustment provided that the ambient temperature at the indicator does not change much. Given that the liquid and vapor are in direct contact with each other, the pressure in the system will be precisely equal to the saturated vapor pressure at the vapor/liquid interface. This makes the Class II system sensitive to temperature only at the bulb and nowhere else along the system’s volume. Because of this phenomenon, a Class II filled-bulb system requires no compensation for temperature changes at the indicator. 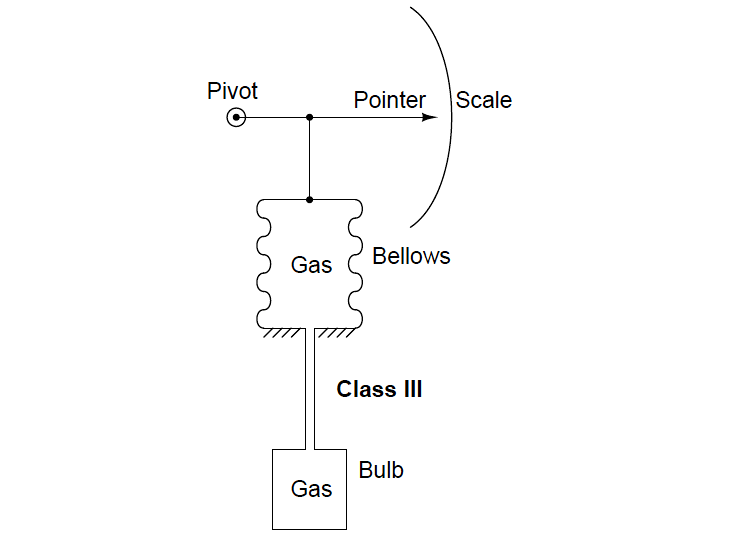 Class II systems do have one notable idiosyncrasy, though: they have a tendency to switch from Class IIA to Class IIB when the temperature of the sensing bulb crosses the ambient temperature at the indicator. Simply put, the liquid tends to seek the colder portion of a Class II system while the vapor tends to seek the warmer portion. This causes problems when the indicator and sensing bulb exchange identities as warmer/colder. The rush of liquid up (or down) the capillary tubing as the system tries to reach a new equilibrium causes intermittent measurement errors. Class II filled-bulb systems designed to operate in either IIA or IIB mode are classified as IIC. One calibration problem common to all systems with liquid-filled capillary tubes is an offset in temperature measurement due to hydrostatic pressure (or suction) resulting from a different in height between the measurement bulb and the indicator. This represents a “zero” shift in calibration, which may be permanently offset by a “zero” adjustment at the time of installation. Class III (gas-filled) and Class IIB (vapor-filled) systems, of course, suffer no such problem because there is no liquid in the capillary tube to generate a pressure due to height.